Driving in the U.S. is safe for the most part, but there are some roads that exist here that have higher levels of danger. From California to Connecticut, discover more about some of the most dangerous roads in America. California is home to a number of the country’s most dangerous roads. One of these roads is California State Route 138. This road has been referred to as the “highway of death” or “death road.” It runs from Interstate 15 to a town called Palmdale. It has been reported that in a period of five years leading to the year 2000, there were a total of 56 deaths and 875 injuries on the road alone. It is a steep two lane road which had as many as 10 fatalities a year at one point. In recent years, conditions on the road have improved. The I-15 from Los Angeles to Las Vegas is yet another risky road. Millions of people use this road each year, increasing the risk of driving on it. This stretch of road has the most fatalities in the state, with lives claimed by drinking and driving and distracted driving. Failure to wear seatbelts contributed to the high number of fatalities in those cases. There are quite a few dangerous roads in the southern states. 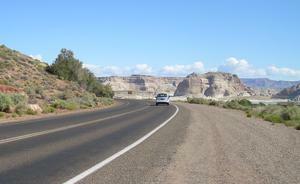 One such road is the I-10 in Arizona, which stretches from Phoenix to the border of California. This road has seen up to 85 deaths per year, with the entire state of Arizona totaling 700 a year. The I-26 in South Carolina is another road that has seen a lot of deaths, with 325 people dying in 286 wrecks from 2000-2010 as a result of the road’s steep slopes and side ditches. U.S 431 in Alabama is also home to many accidents. Narrow lanes and lack of visibility can be blamed for the high fatality count. From 1999-2010, there were 20 deaths on this stretch of road alone. Many victims of accidents on these roads are injured due to no fault of their own. If you are one of these people, you can count on Bruce Hagen, Attorney at Law, to win compensation on your behalf for car accidents. Highway 2 in Montana is so dangerous that it propelled the entire state of Montana to have the highest fatality rate in the US. On this road, it can take ambulances as long as 80 minutes to get victims to hospitals. Motorists tend to drive faster on this road because of the lack of traffic. Dalton Highway in Alaska is driven mostly by truck drivers, and while it has a low fatality rate compared to the other roads, it has many twists and runs around steep mountains, making it dangerous for those who do drive it. I-95 in Connecticut has 735 crashes per year, much above the average of 600 for roads of the same size. It has curves and hills which make it difficult to drive. The U.S 24 from Fort Wayne to Toledo is the site of many head on collisions between the commercial trucks that frequent the road. It was even nicknamed the “dead man’s curve.” Luckily, the narrow lanes were widened with hopes of decreasing fatalities. If you ever find yourself a victim of an accident on these or any other roads, contact the Hagen Law Firm for help getting the justice you feel you deserve.